Before we explain these big changes, let us first list all the points we have revised. Fixed a few minor bugs and increased stability. 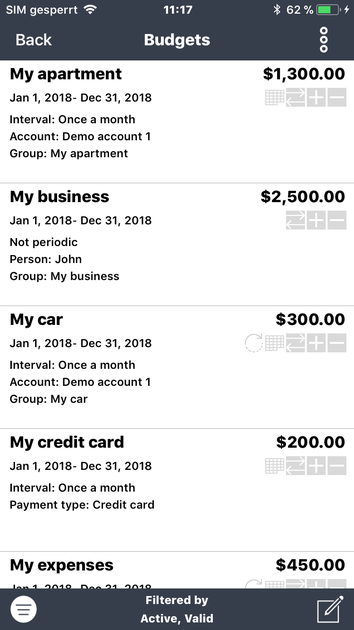 The in-app dialog has been completely redesigned, and provided with new content. You can unlock four separate packages (split entries, savings goals, currencies and extended evaluations), or purchase the full package for a fair price. This ensures the two years of development and support for the further development of this great app. The toolbar under "current" can be customized by configuring or hiding it. We reinstalled the old account display, and moved it into the menu. You can also control the view on the toolbar. 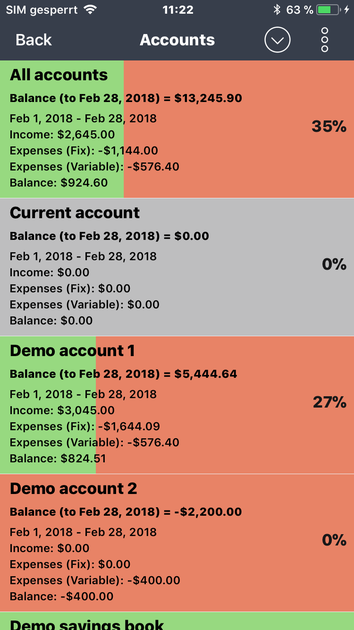 In some dialogs (account management, recurring entries, budgets, savings goals, rules) a new filter function has been added for you to be able to hide items such as expired or deactivated items. The dialog view has been revised and expanded with additional options. Today’s entries can be highlighted in the entry list (by option). 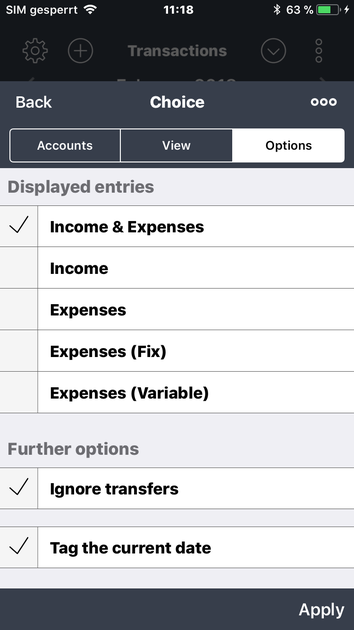 The account balance is also displayed in the entry list, when the view has been set to "days". You can hide this information with the "detailed display" setting. There is a new setting ("Detailed display") which allows you to reduce the displayed information. 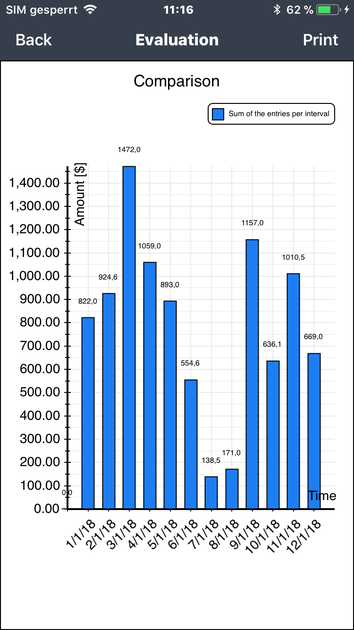 The overview shows the monthly amounts and the current daily amounts. Depending on the view mode, the corresponding sum is highlighted. You can hide this information with the "detailed display" setting. The search feature has some new presets ("This month", "This quarter", "This six months", "This Year"). The advanced search has new search criteria ("entries with voucher" and "split entries"). Recurring entries and split entries can be corrected with the function "Search & Replace" (to a limited extent). 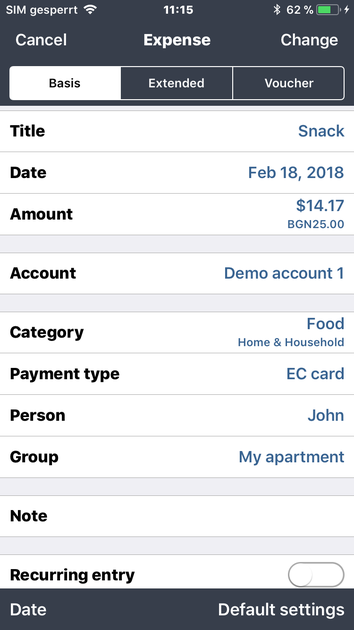 If the entry input is interrupted and disappeared from the app, the last inputs would be taken into a new entry input. In the settings there is a file manager to delete local or iCloud data. The CSV rule assistant has been extended with the criteria "tagged, cleared, fixed entry, documentation". The option "open end" has been removed for recurring entries. Now, the expiration date is always displayed. This option often caused misunderstandings. The entry criteria (categories, payment types, persons, groups) can be printed out for the documentation. There are further options for data protection (Set dynamic file names, overwrite: yes/no, create additional local backup: yes/no). In the statistics, a new view "main categories/sub-categories" and a sort sequence (ascending, descending) have been implemented. 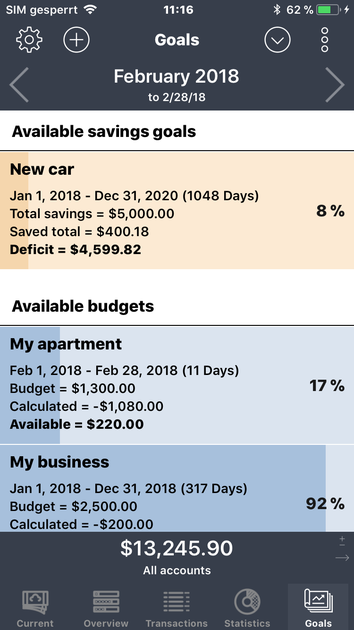 In the goals display (budget & savings goals) you can travel through time now. 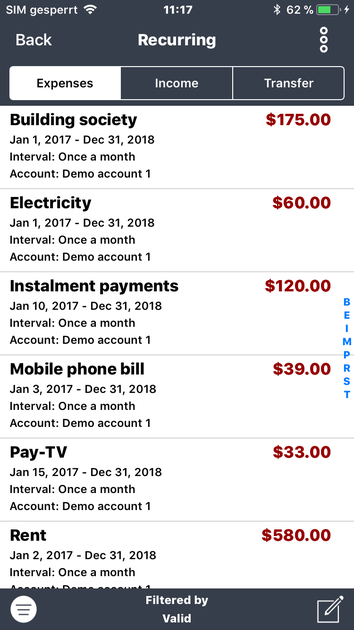 Notifications for recurring entries, budgets and savings goals can be disabled as desired, if they expire. All diagrams are revised and flaws are eliminated. The fast input has been integrated into the menu. The icons have been revised. Support for other CSV formats (Wüstenrot Bank AG, Kreissparkasse Köln, 18400 Generali Bank, Pennies App, Money Coach App). The iPad variety has been revised in some places. Many of the listed changes will be available for free, so you can benefit from the update without the new in-app packages. We will expand the current in-app packages and provide a reasonable number in the future. We do not intend to release an in-app package for each new feature. This release is so far the biggest update. Please indulge the minor errors. After the release, we will collect the errors that have occurred, and release an update shortly after. Aside from that, not all functions were implemented due to time constraints, so we will complement the missing points. Create a local backup easily and connect the device to your computer. Open iTunes and click Apps on the left side (settings). On the right side (apps), all shared apps are displayed in shared data. After clicking on the app 'My Budget Book', you will see the current backup (*.MHC) in documents. Save this file locally on your computer (button 'Save as') or drag & drop the file onto your desktop. 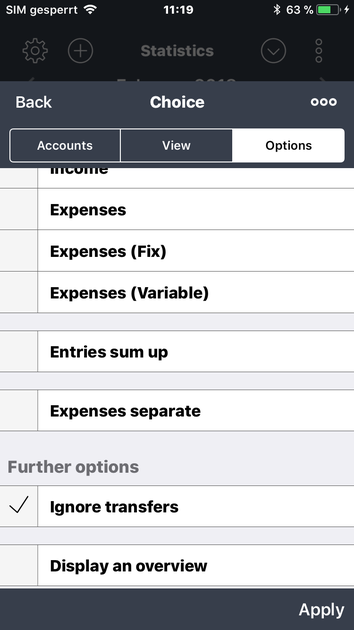 Click on the app 'My Budget Book Pro Edition' and add this file (button 'add') or drag & drop the backup file. Finally, start the new app and import the file under settings/recovery. Done. 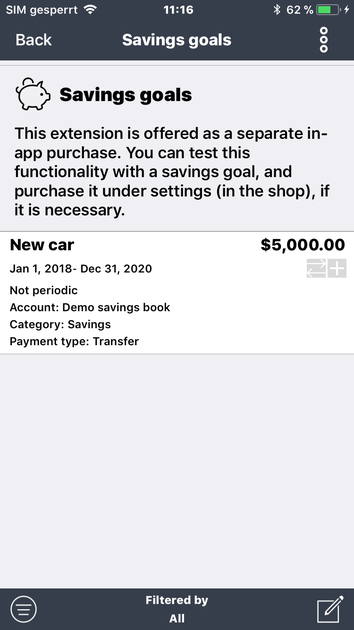 After two years of development and support, we decided to unlock some new features through a one-time in-app purchase to ensure the further development of this great app. If you do not need the new extensions, you will still benefit from the bug fixes and new free features every time you update. But you can also purchase the full package for a fair price. The single in-app products are unlocked by a one-time payment. 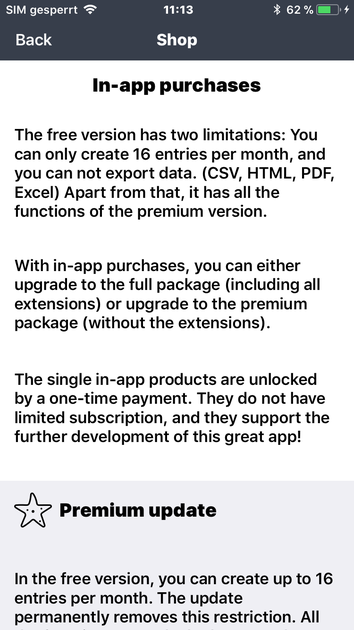 They do not have limited subscription, and they support the further development of this great app! This extension supports split entries. Maybe you know the problem. You withdraw money from the ATM, and make different spendings. You buy new shoes, you get a present for your wife, and you go to a soccer game with your son. There is only one expense on the bank statement. 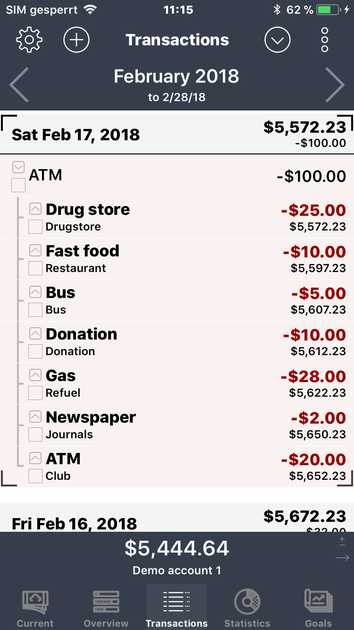 But in your budget book you want to list all the expenses in detail, and you do not want to lose the “ATM” information. For this purpose split entries are introduced, for you to prevent your statistics from being falsified. 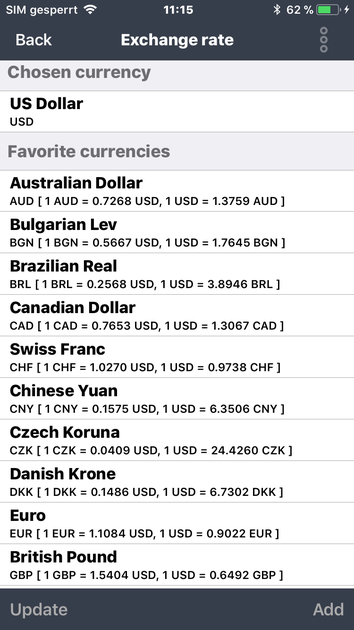 With this extension you can manage any currency, and update the exchange rates manually or automatically. 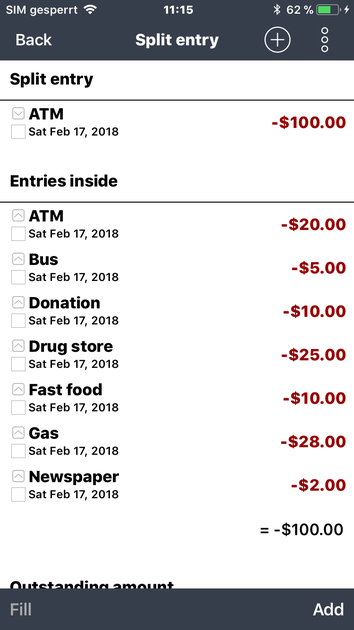 If you choose a different currency when making an entry input, it will be converted into your chosen currency automatically. Currently, we support only the European and the most important currencies of the world. (US Dollar, Australian Dollar, Brazilian Real, British Pound, Chinese Yuan, Hong Kong Dollar, Indian Rupee, Indonesian Rupiah, Israeli Shekel, Japanese Yen, Canadian Dollar, Malaysian Ringgit, Mexican Peso, New Zealand Dollar, Russian Ruble, Singapore Dollar, South African Rand, Thai Baht). 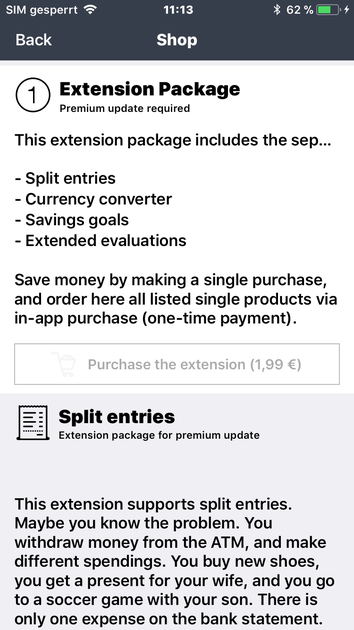 With this extension, you can set as many savings goals as you want, for example, to create reserve funds for larger purchases. Just choose the total amount of savings, define the entry criteria and the validity period. The program takes care of the rest. It's a perfect addition to the existing budget feature. 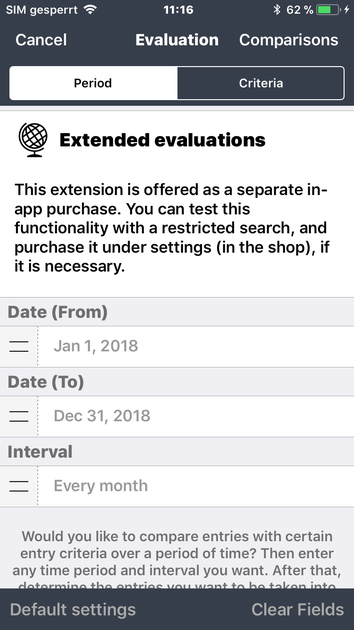 This extention provides you with more interesting evaluations. You can make as many comparisons as you want, and you can see how your incomes and expenses have developed during the comparison period. (Example: Monthly comparisons of all cleared entries with the main category “Sports and Leisure” including all sub-categories in the current year). In some dialogs we have installed an easy-to-use filter function in the bottom left of the status display. Using this, you can choose the entries you wanted to be displayed. Depending on the dialog, the following filters are available: Active, deactive, valid, expired, future. You can use this dialog to select the account, and set the view or sorting of the respective function. Depending on the context, some new options have been added or existing options have been moved out of the settings. (i.e. "Ignore transfers"). 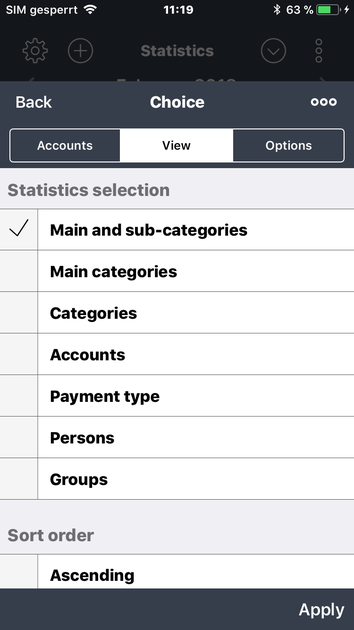 Among other things, there is a representation in the statistics, where all main categories (including sub-categories) are displayed. In addition, you can view all categories, regardless of whether it is a main category or sub-category. 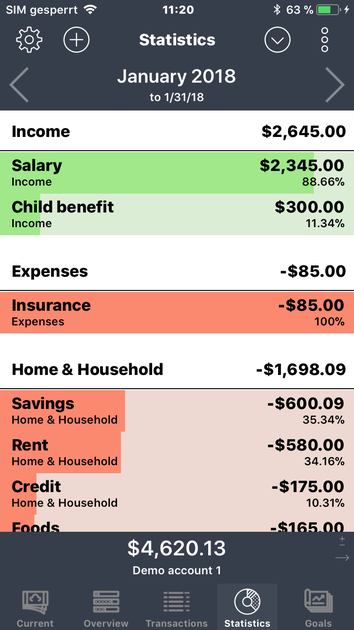 The new view breaks down the main categories into their sub-categories, and presents the sums clearly, giving you a better overview of your incomes and expenses. 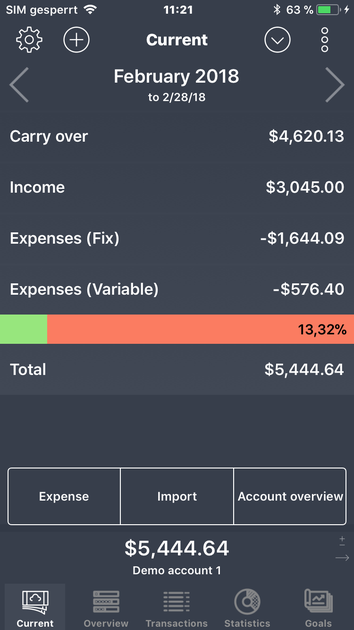 Maybe you know this view of the app "My Budget Book". 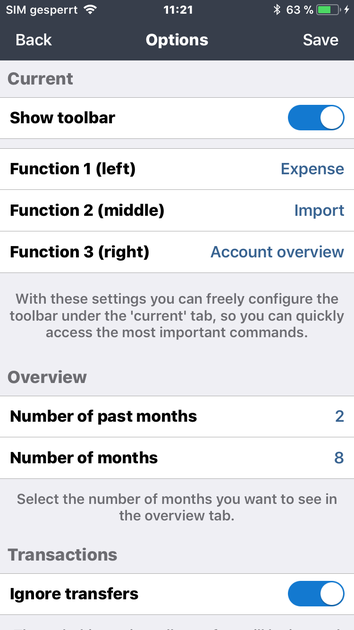 Until now, you were able to use the toolbar under "current" to create new expenses, incomes or transfers. Now you can configure these three commands individually in the new version. It is even possible to hide this bar. 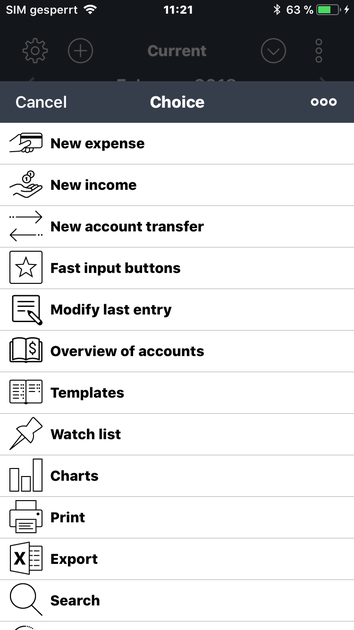 We have reinstalled the old account display to give you a better view for all of your accounts. The selected period is taken as a basis here. You can change this period whenever you want in the dialog. You can either print the calculated data or display it graphically. Don’t forget to rate us in the App Store if you like our app! You can rate 'My Budget Book Pro Edition' after every update. It is much appreciated! Also in the future, the app will be maintained and updated to all new features of the operating system.